At Progressive Foam, we offer insulation products made from both expanded polystyrene (EPS) and graphite polystyrene (GPS), so we field a lot of questions about what Neopor GPS is and how it works. If you’re looking for highly energy-efficient, rigid insulation, Neopor GPS might be perfect for your project. Neopor Graphite Polystyrene (GPS) is highly efficient, rigid foam insulation used in various remodeling and new construction applications, such as behind new siding, below grade, and below slab. Neopor can provide up to 20% more energy savings than traditional white expanded polystyrene (EPS) insulation. Neopor is patented and manufactured by BASF, the world’s largest chemical company. BASF integrates high-purity graphite particles into polystyrene beads to create the raw material Neopor. This material is then shipped to insulation manufacturers, who convert the graphite material into rigid boards that are dark gray in color and provide significantly improved energy efficiency. How Does Neopor Insulation Work? Neopor works in the very same way as traditional insulation, with one primary difference - the high-purity graphite particles give the insulation a reflective property which increases the energy efficiency of the material. 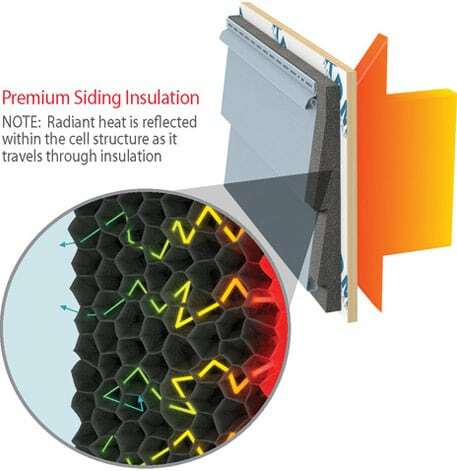 Rigid insulation products trap air inside their structure. This is why large boards of insulation feel extremely light considering their size. Trapped air is a poor conductor of heat, gives the insulation its energy-efficient property. While traditional insulation slows down the transfer, heat still finds the most direct way through the insulation. The graphite component of Neopor causes the heat to be reflected hundreds of times as it moves through the insulation. 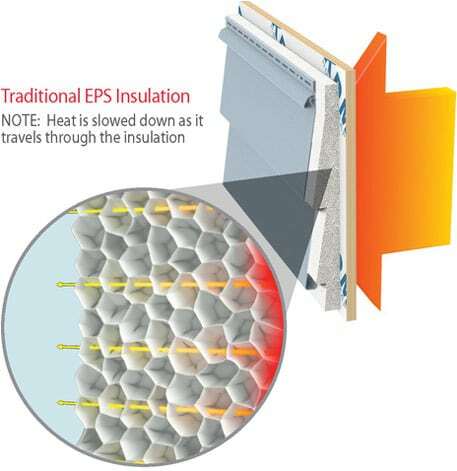 This significantly slows the transfer of heat, making Neopor more energy efficient than traditional EPS insulation. Imagine that heat is a person walking on a path. A path which takes many twists and turns along the way will take longer than a straight path to the destination. That’s how Neopor works; when insulating, we want to slow the transfer of heat as much as possible for maximum energy efficiency. On a cost per r-value basis, Neopor is typically a more cost-effective option than extruded polystyrene (XPS) insulation, providing the same r-value for a lower price. In addition, Neopor features a higher permeability rating. Products with higher perm ratings allow water vapor to pass through the wall, protecting against moisture damage. And unlike XPS products, Neopor can easily be formed into custom shapes during the manufacturing products, for added features and benefits such as increased durability for vinyl siding.